Guided hiking expedition to backpack the Nootka Trail. We fly in with Air Nootka to Louie Lagoon and hike from there to Friendly Cove. This wilderness hiking adventure is often compared to how the West Coast Trail used to be. This is quite simply our favourite coastal trail for it's mix of scenery and terrain and the abundance of wildlife. This is a wonderful wilderness trek on remote Nootka Island, the place of first contact between the First Nations and Europeans on the west coast. It features beautiful pocket beaches, stunning west coast sunsets and lots and lots of wildlife. It also has perhaps the best spot on any coastal hike - Calvin Falls, where we like to schedule a rest day so we can enjoy a swim and some relaxation. 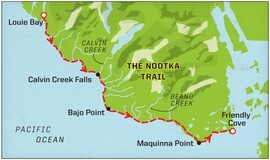 A fairly short hike at a mere 35km (22 miles) long the Nootka Trail remains remote and wild. If done in good weather it is relatively moderate (though technical through the forested sections); catch some bad weather though and it's a whole other story. Even in good weather on some parts of the trail we average about 1km per hour! We offer two options, a 6 day and an 8 day trip. The 6 day option will not include transport to and from the trailhead or two overnight stays in Gold River, one at the beginning and one at the end of the trip. Instead we will meet you in Gold River on the morning the hike begins and say goodbye at the end of the trail. This option may work well for those already in the area with their own transport. If you're coming from further away and do not have access to a vehicle you may prefer the 8 day trip and letting us take care of the logistics of getting there. Be aware that there is no public transport to Gold River and distances in BC are bigger than you might imagine. We provide transport all the way from Vancouver. DAY ONE - For those on the 8 day trip we will pick up at your hotel in downtown Vancouver (airport or other hotels not included) around midday from where we will take a short drive to Horseshoe Bay to catch the ferry to Nanaimo on Vancouver Island (pick up possible here too). A 1 hr 40 min ferry ride awaits. Once on the Island we head for Gold River (4 hours) and our accommodation at the Gold River Chalet. DAY TWO - This morning we meet those on the 6 day trip and at approx. 10am our friends at Air Nootka will take us on a magical float plane flight to Louie Lagoon on Nootka Island (30 minutes). The flight wends its way through inlets and over islands and beaches following the entire length of the trail and allows us to see our route before we set foot on it. Make sure you have your camera ready for this exciting part of the journey. DAY THREE - Today we hike from Third Beach to Calvin Falls. This is a reasonably long day but not particularly strenuous (12 km, 5-6 hours). DAY FOUR - Rest day at Calvin Falls. We schedule a rest day at this wonderful spot but it may be used elsewhere or not used at all depending upon a number of factors. We will have time to relax and enjoy a swim in the falls or in the sea. There is also an excellent reef to explore if the tide allows, one full of sea life. DAY EIGHT - Those clients on the 7 day trip will return to Vancouver with us, leaving at 9am and arriving approximately in the mid afternoon.